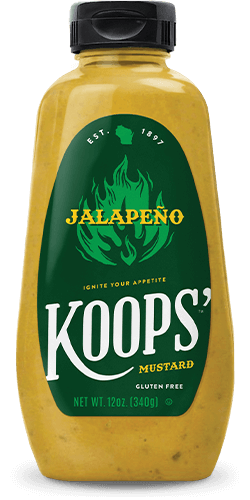 Koops’ isn’t your ordinary mustard. It’s extraordinary mustard. With 14 bold flavors that can satisfy any appetite, it makes good food great and great food amazing. This is America's mustard. Sure, it might not be red, white or blue, but you just try and enjoy the 4th of July without a healthy helping of this star-spangled flavor enhancer. Pair it with burgers, cold cuts or hot dogs. It's a free country, so you're free to enjoy it however you want. Robust, coarse and delicious, our Stone Ground hammers home everything people like about old-fashioned mustards. Put it on sandwiches, rub it on roasts, mix it in dressings. With this much flavor and versatility, this mustard absolutely rocks. 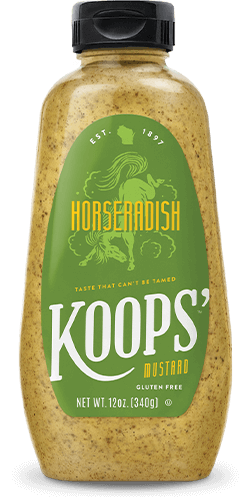 Are you ready to climb into the saddle of the flavor-bronco that is our Horseradish mustard? This bold, zesty favorite has plenty of giddy-up to go around. From sandwiches to dips, if you can handle the kick, this is one bottle you'll want in your stable of condiments. As red as the sun-soaked rocks of the southwest, this mustard brings bold flavor to a new frontier. Made with an innovative blend of peppers and mustard with a hint of sweetness, it's like nothing you've ever tried. And once you've tried it, there's nothing you won't put it on. Just because it's deli-style doesn't mean you can only slather it on cold cuts and hoagies. This thick and delicious mustard is substantial enough to tackle any recipe that could be a little better. So take a number, because our Spicy Brown mustard is now serving great bold flavor. Everyone likes to feel a little fancy sometimes. But if pronouncing "hors d'oeuvre" over and over isn't doing it for you, maybe our Dijon will. With flavor so rich it could have an offshore bank account, it's perfect for fine dining, or for classing up your 5th bologna sandwich this week. Luscious. It isn't ordinarily a word people use to describe mustard. Heck, it isn't a word people ordinarily use to describe anything. But this isn't an ordinary mustard. This is our substantial, sophisticated, and yes, luscious Honey Dijon mustard: a decadent blend of sweet and subtle that elevates anything you add it to. If our yellow mustard is the American classic, our Honey Mustard is America's sweetheart. And while we may not live next door, we're still sweet enough to bring home to momma. Serve us up alongside some good ol' home cookin' for a pleasant taste you can't help but fall in love with. Nothing goes with an iconic German-style bratwurst like an iconic German-style bratwurst mustard. Specifically, this mustard. Creamy and traditional, this bold Bavarian condiment is as close as you can get to feeling authentically German without wearing lederhosen. When you think of iconic mustard ingredients, you probably don't think of Jalapeños. But everything that makes this mustard so unexpected is what makes it so good. With enough kick to liven up any dish, this spicy condiment brings a bit of border heat to every bite. It might sound like an oxymoron to have a mustard that is simultaneously sophisticated and simple. But our Organic Dijon is just that. 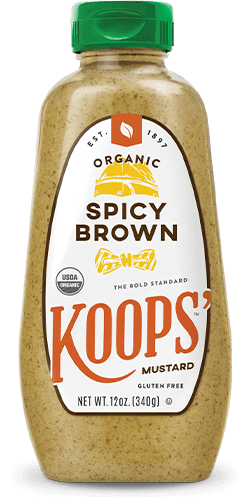 Made without GMOs or pesticides, this mustard's basic, pure ingredients combine into a distinctly refined flavor that everyone can enjoy. When it came time to make our Organic Stone Ground mustard, we didn't change our recipe, we just used an older one. No pesticides. No GMOs. Just bold, coarse mustard like our founder Peter Koops made. When you try it, you'll agree: we nailed it. Have you ever had a sandwich that's so good it made the world a better place? Well you can. Our Organic Spicy Brown mustard is made from the best sustainably harvested ingredients. And while it's greener for the planet, it's just as bold and brown as ever. How do you improve on a classic? Well in the case of our Original Yellow mustard, we couldn't. But we could change the way we grew and harvested it. 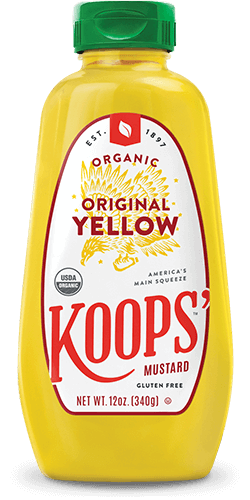 This mustard is still the bold yellow you love, only more sustainable and pesticide-free, so future generations can love it too. There’s no complicated additives on the back of our bottles. No hard to pronounce chemicals or scary sounding preservatives. Just quality ingredients like mustard seed, vinegar and water. 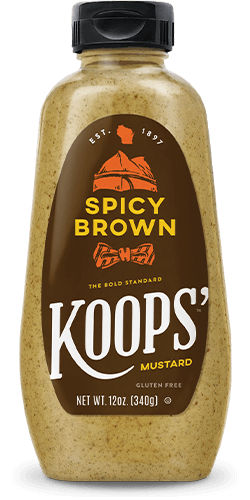 Peter Koops started his mustard business over 120 years ago with a hand crank mustard mill and incredible recipes. And while we’ve updated the manufacturing process with the times, we’ve stayed true to the bold flavor and simplicity of his original recipes. We like to think our mustards make everything you spread them on a little better. Well, now your favorite mustard makes the planet a little better too. Sustainably farmed, these organic varieties have all the flavor and texture of the mustard you love. At Koops’, we’re always hungry for feedback. If you’ve got a question, comment, concern, review, new flavor idea, poem, mustard meme or inspirational quote, share them with us here.